The exhibition witnessed hundreds of exhibitors and thousands of visitors from different regions. Airwheel is pleased to inform that their debut as a spotlight at the LIMA was a huge success. The Airwheel team had exhibited its entire lines of the intelligent scooters amongst which the self-balancing scooter S3 proved to be a highlight. The staff members of Airwheel gave a show-how and a demo at the site guiding their visitors on how to control the scooter. The test drives attracted many guests and everyone who spotted the S3 2-wheeled electric scooter and took a test drive were particularly impressed by the sleek design and the cutting-edge features of the scooter. Some of the features that were most attractive: intention-controlled design that reveals the high-end positioning; intelligent self-balancing system; fully enclosed design that is water resistant, free from water or motor oil leakage; LED atmosphere light; and dual Bluetooth speakers with hi-fi sound quality. The Airwheel exhibit stall was packed with guests and visitors that included traders, businessmen, retail customers, executives and many others who were keen on knowing more about this very impressive S3. 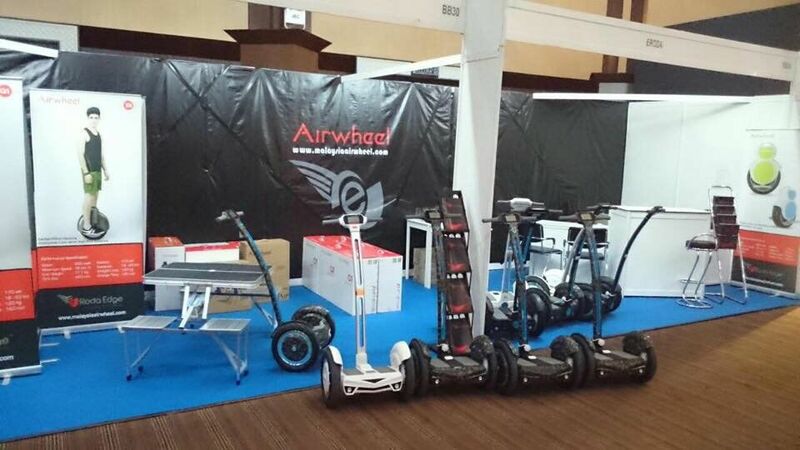 During the 5-Day event, Airwheel exhibited all of its series, i.e. the X-Series, Q-Series and the S-Series. Those who visited the Airwheel exhibit stall got a clear idea about various models available and those who requested for a show-how and a test drive, the staff ensured that the guests got the same. The Airwheel products have become the number one choice for commutes in factory warehouses, trade fairs, shopping malls and daily commute. The one thing is that most impressive scooters contribute to the low-carbon lifestyle. It is not going to take much time when Airwheel self-balancing unicycle will occupy majority of the roads in the near future.